In 2016 Qurban Organization, which we started it with ‘our qurbans for brotherhood from family to ummah’ slogan, we took a road for being bairam happiness of our poor and oppressed brother in the world. Yardımeli teams arrived 45 districts of the world, not only removed qurban meat to brothers who look forward, but also they did happiness for them. As Yardımeli foundation, since from 2017 to now, we transmitted donor’s qurbans to oppressed, poor, indigent and victim brothers from different geographies of the earth. In Turkey 81 province delegations, we worked with all power for aiding to oppressed with offices and partner foundations in abroad. From day one not only we work to feet their bodies but also we work to feet their mind. In addition, Qurban Bairam is a new occasion for us forever. We saw needy of each district that we arrived hereby qurban. We listened that geography’s problem from in person. There are qurban organizations that behind all project which we decide to do it, start or finish. Therefore, qurban bairam is just not mean that meat for us. It is also an occasion for analyze needy of district and make actual to permanent projects. We transmitted our donor’s qurban donation to overall 35 countries in 2016 year Qurban Bairam. We did bairam happiness of 800.000 our oppressed brothers in 35 countries and 45 districts. We understood again that Qurban is all-purposed worship. We understood again that Qurban is the social solidarity. We understood that Qurban is the social cohesion movement. So, Qurban is caused that empower brotherhood from family to ummah. Our teams that occurred from foundation volunteer, from foundation members and foundation member of board campaigned to all district of the world in Qurban. The team is also found in foundation president Dr. Sadık Danışman, Europe Coordinator Hayriye Tufanoğlu and Mustafa İslamoğlu scholar, went to Şanlıurfa, Hatay and Kilis provinces where Syrian refugees are the most in there, and they sacrificed qurbans and distributed to needy persons. We transmitted granted qurban by proxy especially to needy persons in our country, then in the difficult conditions of the war that our Syrian brothers, to Ceraplus. To Palestine that the heart of Islamic world in the Middle East… We reached our brother in Balkans who son of Fatih. The first soil of civilization is Mesopotamia and Middle Asia.. To Afghanistan, Pakistan, In Africa from Mauritania to Somalia, to Niger and Mali, to Sudan, to Ethiopia that homeland of Necaşi.. In short, we extended our helping hand to every brother who we know that they are needy. 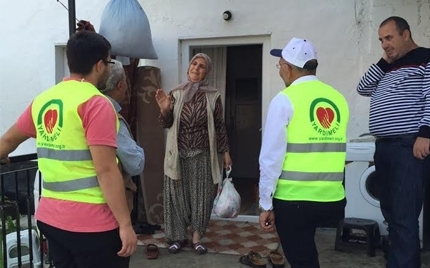 With Qurban organization, each of volunteer and responsible of Yardımeli carried Anatolia’s salute, love and values, they discharged the responsibility.